Chinese painting is one of important oriental arts that reflect the Chinese nation's specific aesthetic standard. It has received great popularity in the world for its uniqueness and cultural richness and quite suitable for home decoration and personal collection. Artisoo offers the largest and finest selection of original hand-painted Chinese paintings, including landscape painting, birds&flower painting, figure Painting, animal painting, calligraphy painting and scroll painting. 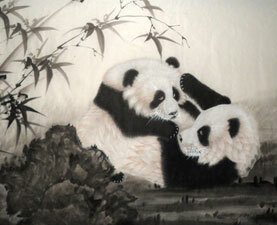 Each Chinese painting is one-of-a-kind and meticulously painted by our talented artists. Browse all Chinese paintings in the pinterest way. Chinese landscape painting is the painting that takes landscape as themes, treats the natural mountains and rivers as major description objects. 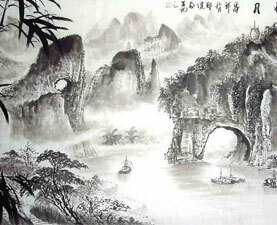 The mountain-and- river painting of Chinese painting belongs to landscape painting. 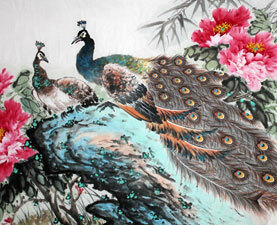 Chinese bird-and-flower painting is a kind of Chinese painting named after its subject matter. 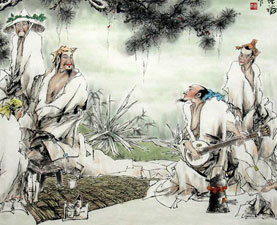 Normally, most bird-and-flower paintings belong to the scholar-artist style of Chinese painting. It can thus deal with a wide range of natural topics, including flowers (plants), fish, insects, birds, etc. Chinese Figure Painting, includes beautiful women, minority girls, boys and other famous figures in Ancient China. The beauties, whatever the court ladies in garden or famous ancient China beauties, are created gracefully, delicately and vividly. Chinese animal painting, include Dragon, tiger & phoenix Chinese painting, Kylin painting, panda, monkey painting, rooster, cat & eagle/ hawk, lion China painting, mouse, pig, dog, cat, sheep painting, etc. As the auspicious animals, they particularly have some certain characteristics and advantages, and their natural characteristics are corresponding to the high hopes and good wishes of human being. Chinese calligraphy painting is a form of calligraphy widely practiced and revered in the Sinosphere, which often includes China, Japan, Korea, and Vietnam. 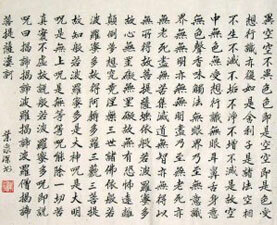 The calligraphic tradition of East Asia originated and developed from China. There is a general standardization of the various styles of calligraphy in this tradition. 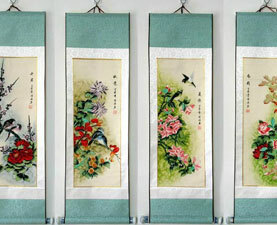 A hanging scroll is one of the many traditional ways to display and exhibit Chinese painting and calligraphy. Displaying the art in such way was befitting for public appreciation and appraisal of the aesthetics of the scrolls in its entirety by the audience. The traditional craft involved in creating such a work is considered an art in itself.